At the beginning of August Alex and I had the chance to visit Portland, Oregon. 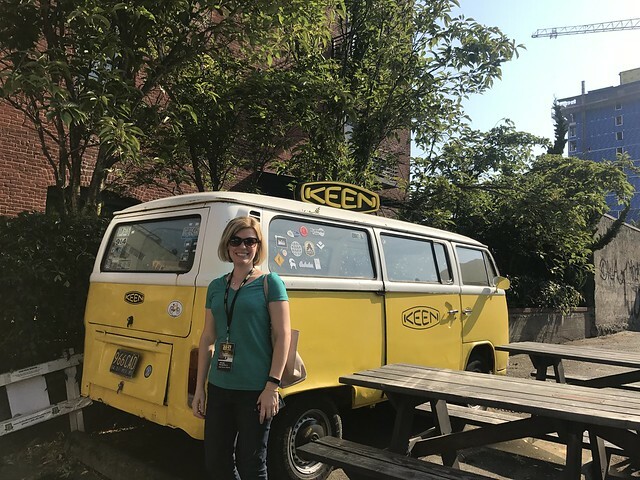 It was the first time in Portland for both of us, and our introduction to the area was by way of a record breaking heatwave in the Pacific Northwest and the knowledge that Portland is "weird" and the people who live there love it that way! Our primary reason for going to Portland was to learn about KEEN Utility footwear. Alex was there on behalf of Charles & Hudson to cover the event, while I wanted to explore a new city as well as to learn about KEEN and how they might help Alex prevent another broken toe due to inappropriate footwear while working on projects. Trust me, it’s a real problem of his. He was actually nursing a broken pinky toe during our visit, how ironic given our reason for being there. We kicked off our trip with some serious Portland exploration. We’d heard about all of the food, breweries, and beautiful homes in Portland, so we wanted to be able to experience all of it firsthand. We also heard about the 105 degree temps looming later in the week, so we had one evening and one full day to pack in as much as we could before the heat wave made it unbearable. We were staying centrally in the Sentinal Hotel in downtown Portland, which is an absolutely beautiful building that was once an old Elks Temple. Just look at the amazing ceiling in the hotel lobby. It was beyond impressive. 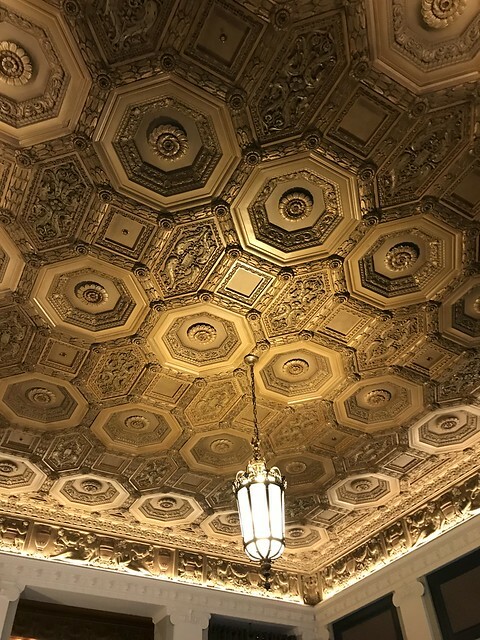 Not only was the building impressive, but the décor of the hotel was right up my alley. Everything from the common spaces to our room were beautifully decorated and inviting. 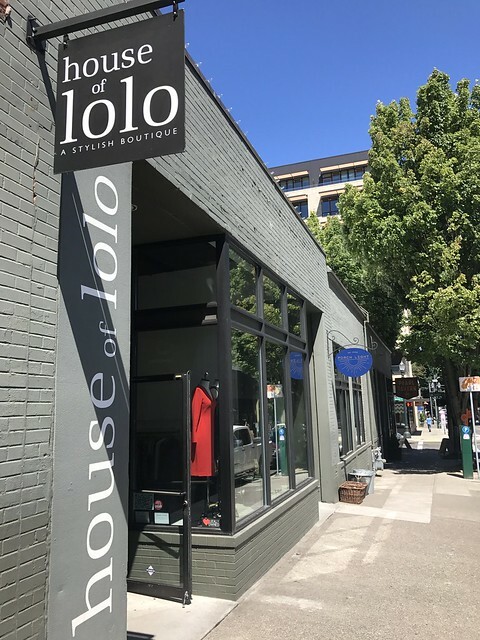 If you’re headed to Portland, I would certainly recommend staying there. 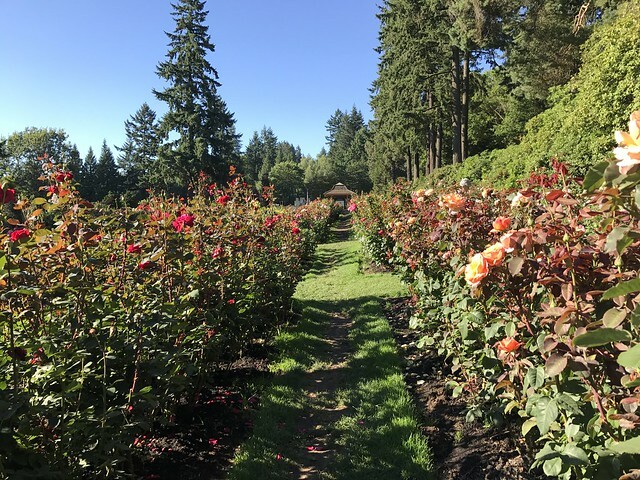 Since the Pacific Northwest is also well known for their temperate climate, rainfall, and greenery throughout the region (though it was particularly hot when we were there…did I mention that? 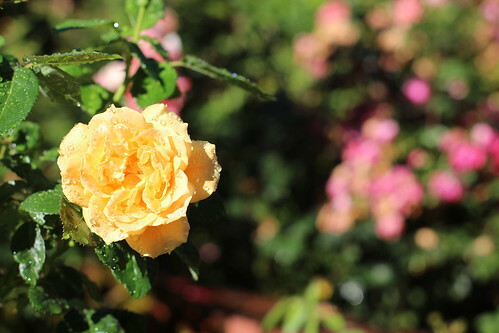 ), it comes as no surprise that you can find an International Rose Test Garden at the edge of town. Before the temperature climbed on the morning of our first full day, we ventured out for a little hike to explore the area and what it had to offer. What we found were rows upon rows upon rows of beautiful roses. It was early in the day and the sun was low over Mt. Hood in the distance. We wandered through the roses and took it all in. 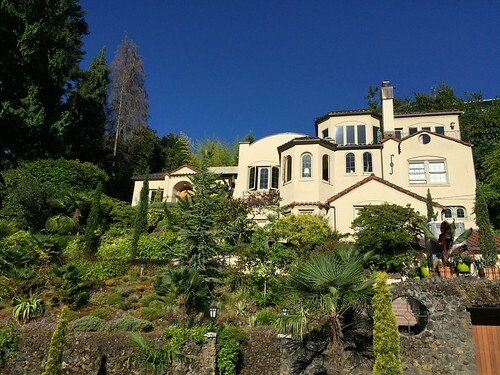 Immediately next to the Rose Test Garden is a neighborhood filled stunning homes. As we normally do, we wandered the sidewalks of the neighborhood and gawked at each one of its homes' interesting details. 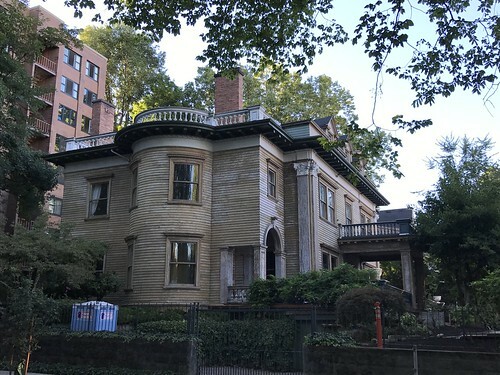 As with many US cities with a history reaching back to the 19th century or before, Portland is divided into several distinct neighborhoods within the city limits. 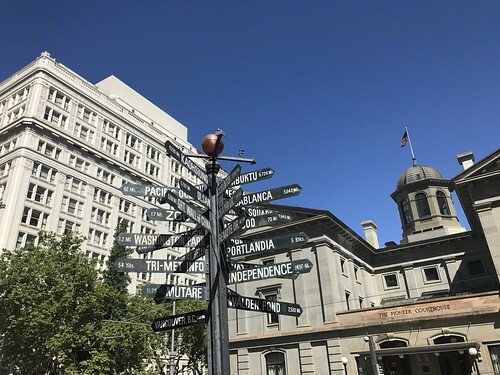 We spent most of our time in the Old Town Chinatown, Pearl District, and Nob Hill neighborhoods of Portland, though we did make an obligatory stop at the crazy Pioneer Portland Square directional sign in the city center/downtown area. Each of the neighborhoods has an identity and it’s pretty easy to tell when you move from area to the other. For example, the Nob Hill area is filled with impressive Victorians and has far more open and green space. 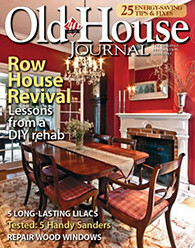 We even stumbled on a house that was in the midst of a complete renovation and paint stripping project. I can't imagine the amount of time that's been put into this project. 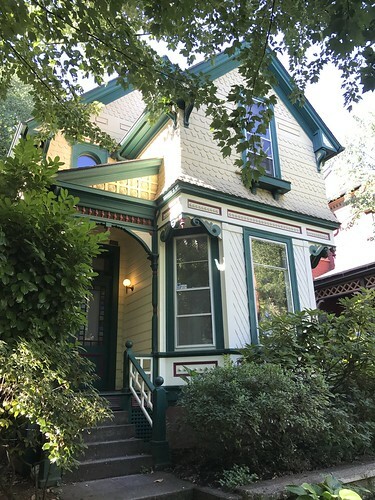 It seemed everywhere we turned we saw yet another beautiful old home that added to Portland's charm. On the other hand, Old Town Chinatown has a far more gritty urban feel (though it’s only a handful of blocks from Nob Hill), with fewer natural green spaces and trees planted in sidewalks like you’d expect in a major city’s downtown area. We spent quite a bit of time walking and shopping in Old Town Chinatown, and also visited a brewery or two. 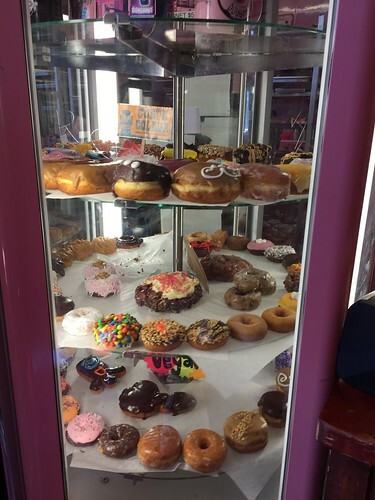 This neighborhood is also where you can find the original Voodoo Doughnuts, where we had to make an obligatory stop. 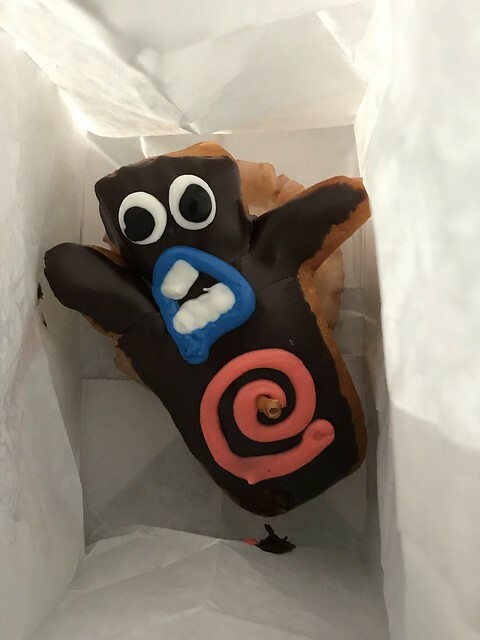 In case you're wondering, Alex went with the "Old Fashioned" doughnut, while I couldn't resist the very cute "Voodoo Doll," with red jelly filling. 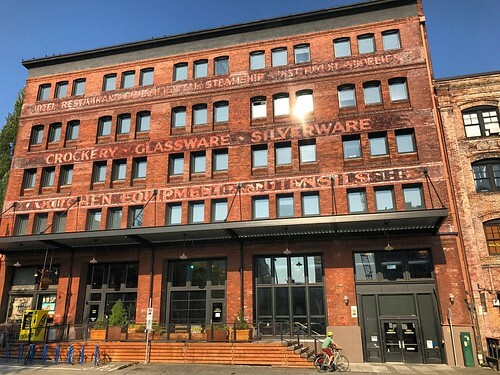 The Pearl District is sandwiched between Nob Hill and Old Town Chinatown and is where Portland’s major urban revitalization is underway. This neighborhood is home to what was Portland’s warehouse district, but is now where you can find trendy restaurants and shopping that show where Portland is headed. 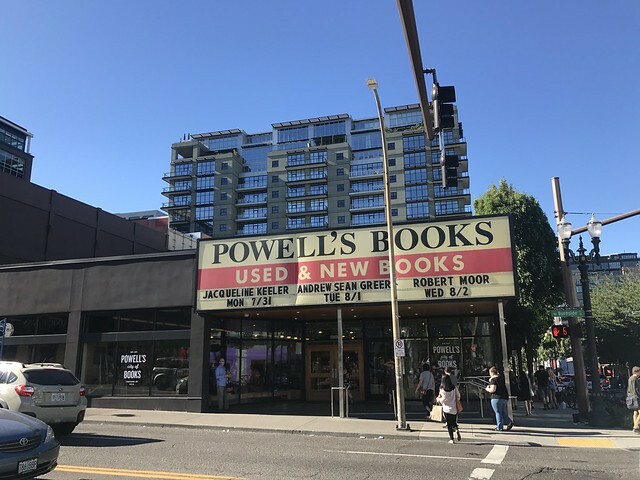 You may be familiar with one of the Pearl's most favorite and famous shops, Powell's Books. 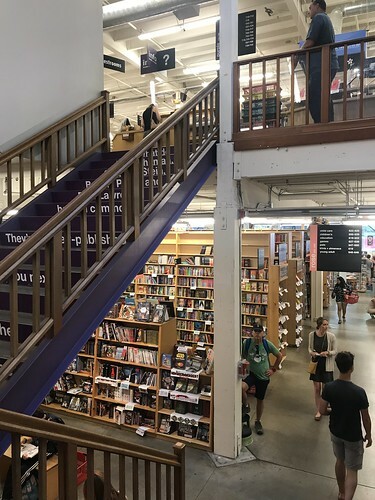 This world famous bookstore is also the largest new and used bookstore in the world. It's a book lover's dream with room upon room of selections, titles, and genres. 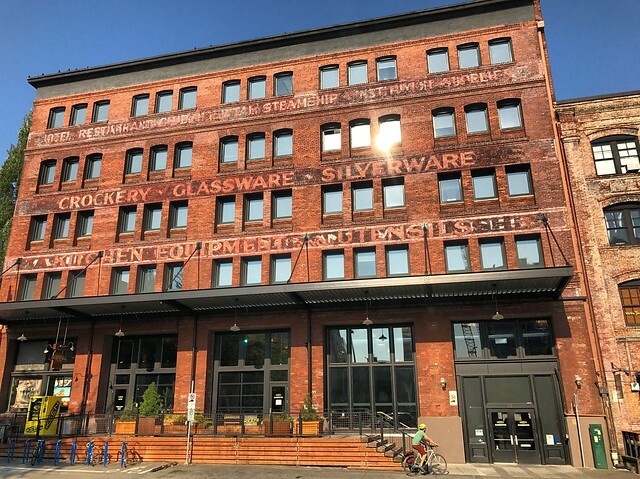 Also in the Pearl District, we found dozens of restaurants, breweries, and shopping options to satisfy even the most discerning visitor. 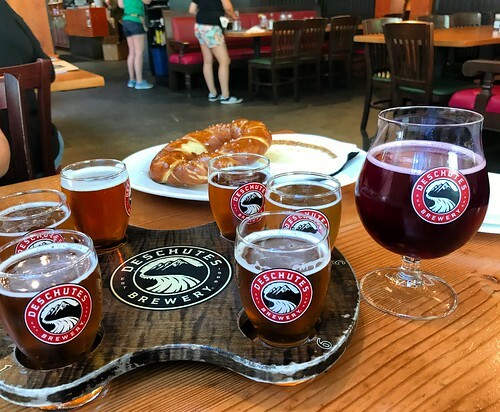 We seemed to fall into a habit of visiting breweries between stops in shops and trying our everything from sour and fruity beer to bold stouts…but we made sure to always add a pretzel to the order. It was a great way to beat the heat. Deschutes Brewery was one of our favorite stops, for both the food and the beer, but brewery after brewery we kept finding our "favorites." Portland certainly does food and beer well, that's for sure! One thing is for certain. 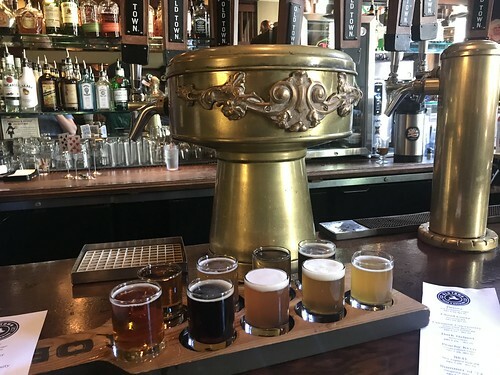 If you're a beer lover and find yourself in Portland, you won't find it difficult to discover things you'll enjoy. 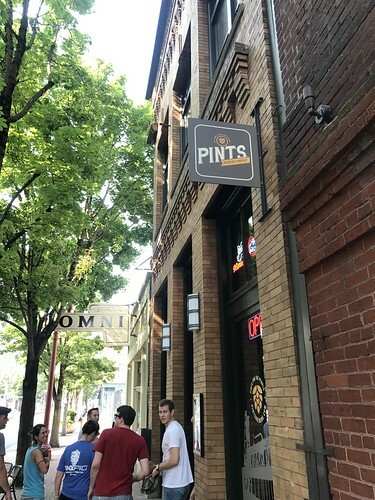 After packing in nearly 14 miles of walking in the day and a half we explored Portland, we'd seen and learned a lot about Portland from a tourist's standpoint. So when it came time to visit the KEEN office, we were very interested to learn more about Portland from the perspectives of some locals. 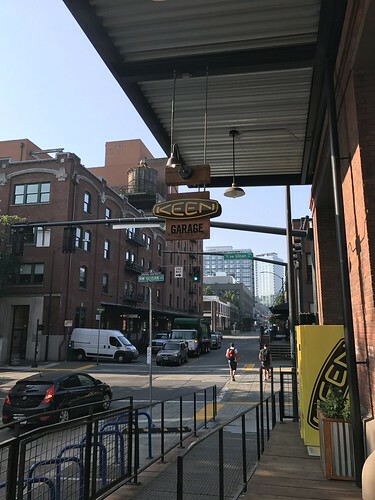 KEEN’s headquarters building is located in the heart of Portland’s Pearl District, and it is nestled among large factory spaces that are enjoying a significant urban revival as Portland’s historic neighborhoods have quickly transformed into hip and sought after destinations. After the space underwent a massive renovation just a few years ago, Keen moved their offices from about five blocks away and took up residence in the Simon Building, which is a recognized National Register of Historic Places location. 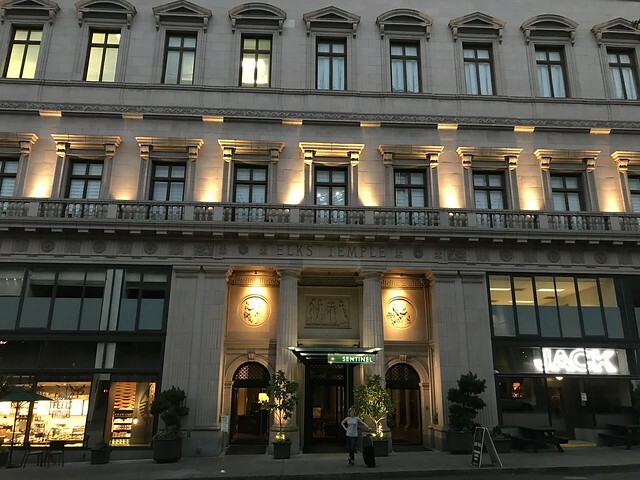 We were given a tour of this impressive building during our visit. 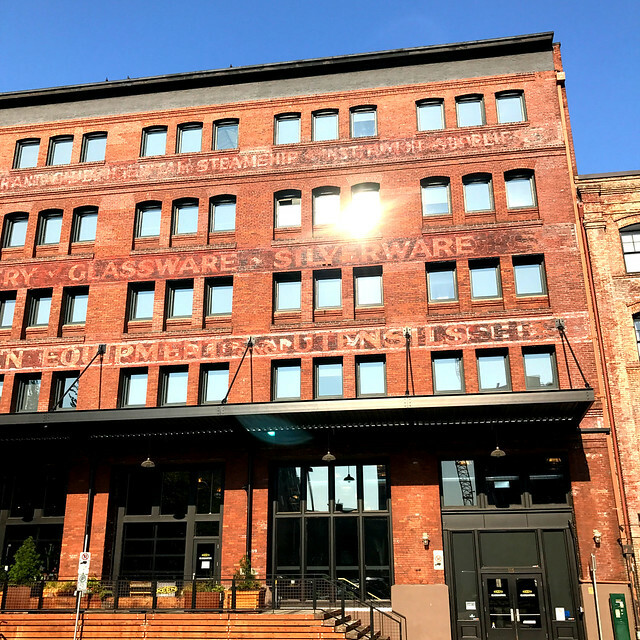 The Simon Building started life in 1907 as a manufacturing and storage facility for steamship accessories. 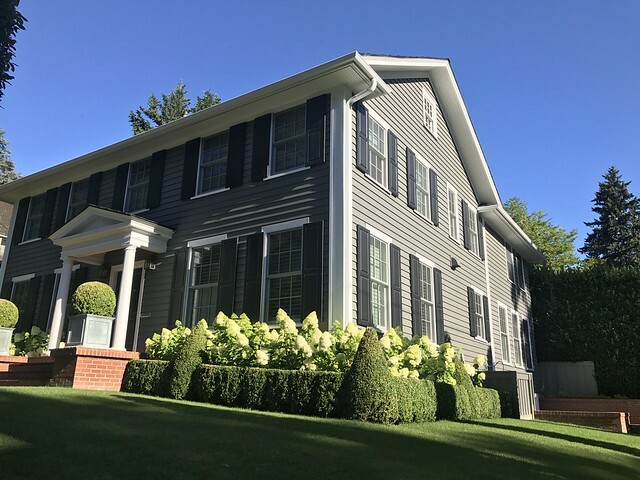 Over the years it has served many purposes, more recently this beautiful masonry and timber building has been an office for other commercial manufacturers. 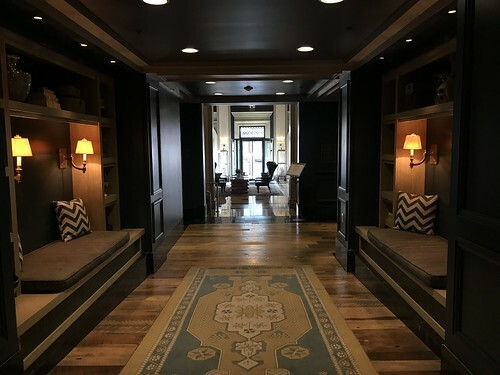 Through KEEN's renovation, their construction team stripped away layers of paint and more recently added partition walls to expose the beauty of the massive and open interior. 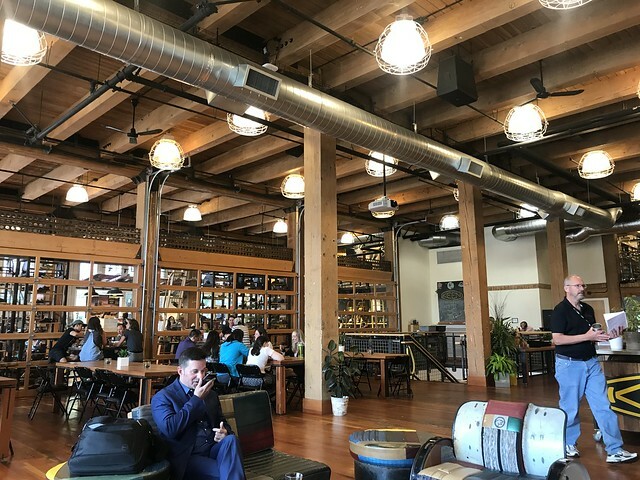 The re-imagination of the space has created a stunning example of reuse and repurposing while retaining the original structure and feel of the building. 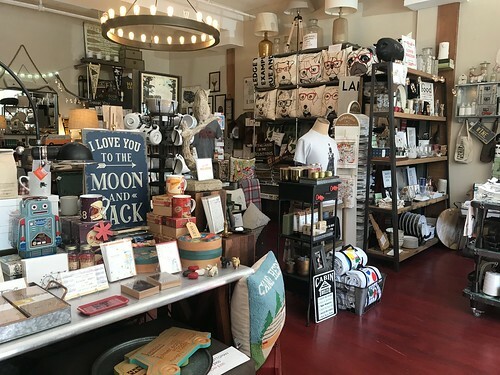 Wherever possible materials were salvaged, reused, and repurposed to minimize waste and any unnecessary addition to landfills. 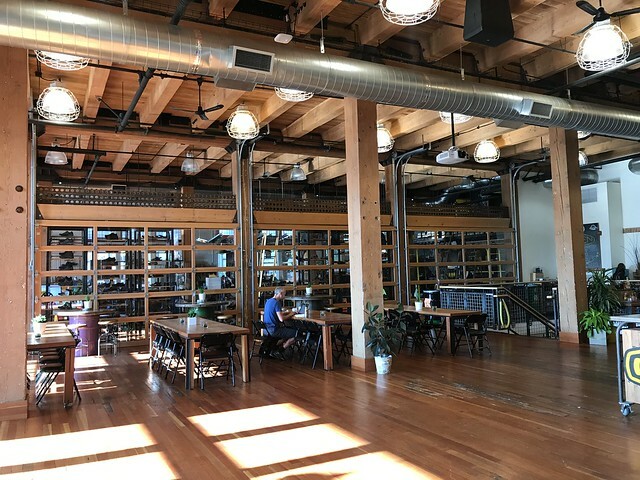 The company's owner and family are extremely environmentally conscientious people, and went to great lengths to breathe new life into this amazing building while simultaneously trying to protect the environment. 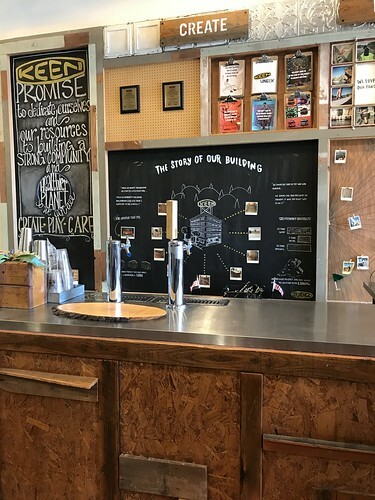 The story of the building's evolution is proudly described on the blackboard behind their office bar in the main gathering area. Yes, that's right...their office bar. For example, it was proving very difficult to rid the interior timbers of their many layers of white paint. Rather than leverage harsh and caustic paint stripping approaches, the construction team used the ground up glass from windows that were removed from the upper floors to sand-blast away the years of paint and expose the amazing antique and massive timbers throughout the building. 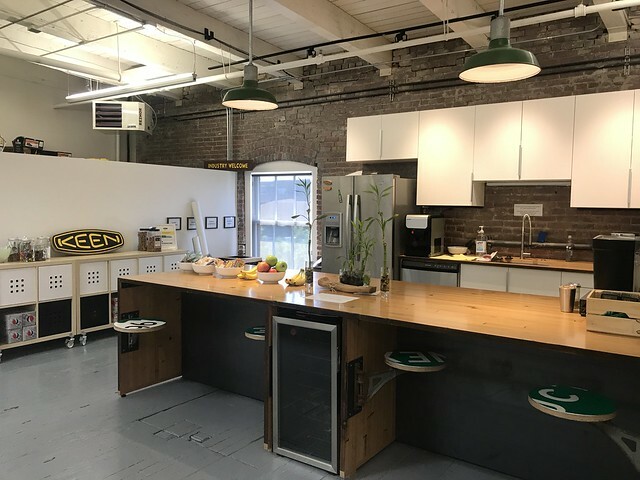 The impressive headquarters houses several floors of open office space as well as their KEEN Kanteen cafeteria, and the KEEN Garage retail location. The basement houses a bike storage area where their employees can park when they ride to work, the employee common spaces on each floor take advantage of the awesome character of the historic building, and all over the building they've gone to great lengths to reuse materials for everything from counter tops (like old bowling alleys from the founder's neighborhood), or road signs or metal barrels for seating. While you’ll more commonly see their products offered in places such as REI, Bass Pro Shops, Cabella’s, and online, if you’re a fan and find yourself in Portland, you should definitely pay the KEEN Garage a visit. They even stock a few products, like utility pants, that are only available at the Garage. 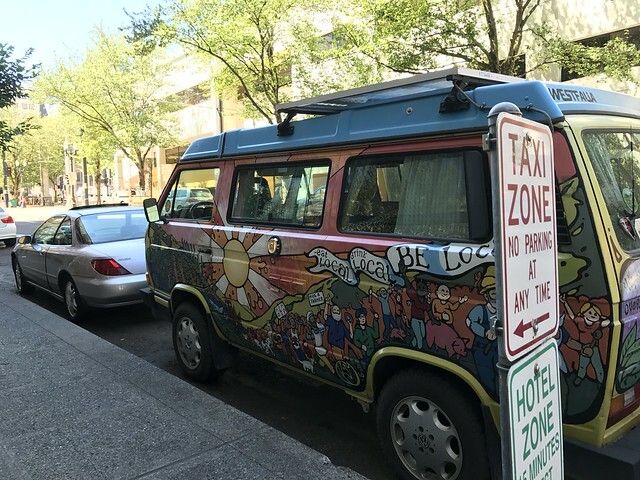 Their building is very indicative of the rest of Portland, and the idea that Portland is "weird" can be seen by looking across the street at the cool old KEEN VW bus parked next to some employee parking and picnic tables. 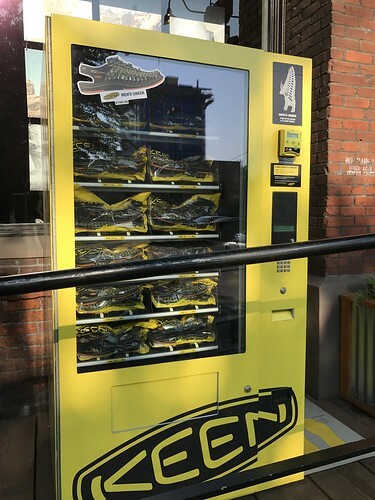 Or the fact that you can buy a pair of walking sandals from their vending machine in front of their office. It was a treat to get a glimpse into the inner workings of this very environmentally friendly building and office space. These are the sorts of things you don't normally get to experience when you're simply playing tourist in a town. If you'd like to learn more about KEEN Utility and their Portland factory, be sure to check our Alex's KEEN Utility Factory Tour recap he wrote over on Charles & Hudson. We've both wanted to spend some time in Portland for a while now, and I'm very glad we had the opportunity with this trip. Though we didn't get out of town to enjoy the Oregon coast, or do any hiking in the parks, experiencing the city of Portland was a great first step and introduction to Oregon. 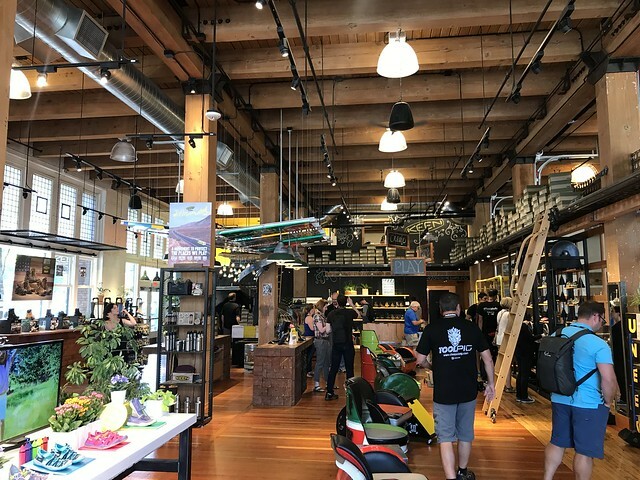 It was also very unique to experience a bit of Portland by learning about it through the eyes of locals that work for a company that has a significant local investment in the area. 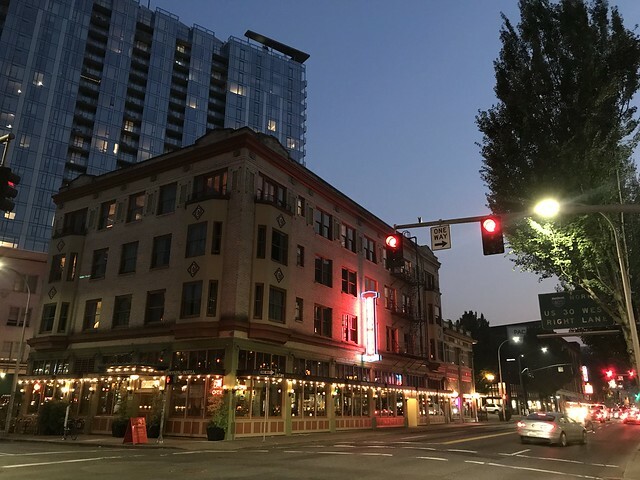 More than anything we learned that Portland has a rich history with many wonderful legends, but Portland's recent resurgence in culture and acceptance of everyone is its true attraction. 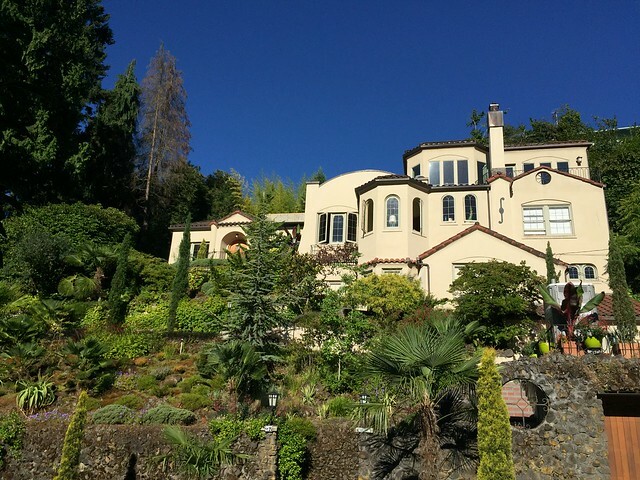 Portland has many diverse landscapes, populations, and interests, and the people that live in the PDX area are passionate about their home. This passion seems to extend from their often active leisure activities to their chosen careers. Like any major city on the rise, the infrastructure of Portland is trying to keep up with the burgeoning demand and influx of people. There are major construction projects on many city corners, but the vision and direction of the area is apparent. Portland will continue to change for many years to come, but it's certainly worth checking out right away. Have you been to Portland? If so, what do you think of the area? 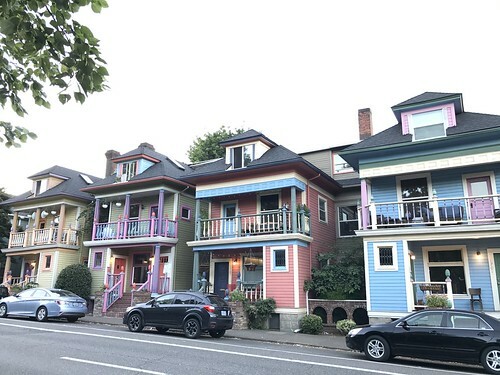 And if you live there, are you as passionate about your home as most of the Portland residents we met during our time there? 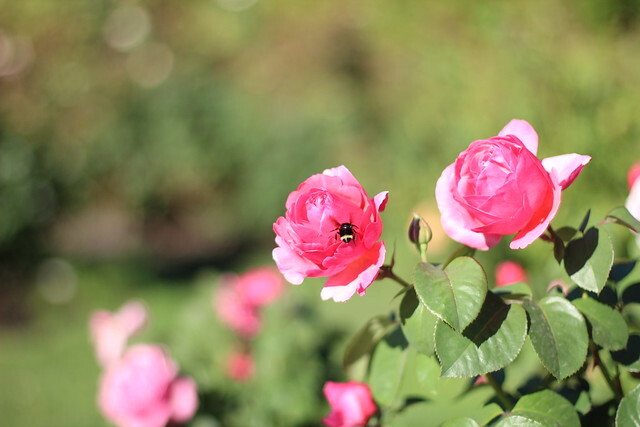 I have never been to Portland, but your tour shows some really great reasons to put it on my list. You did a good job highlighting many different aspects like neighborhoods, architecture, breweries!, shopping, more breweries! etc. You didn't mention the amazing food carts! Hope you were able to sample them. Just incredible! Portland rocks! I love Portland and my husband wears KEEN at work (actually, he has work boots AND hiking boots). I shared your factory tour with him and he was super into it. 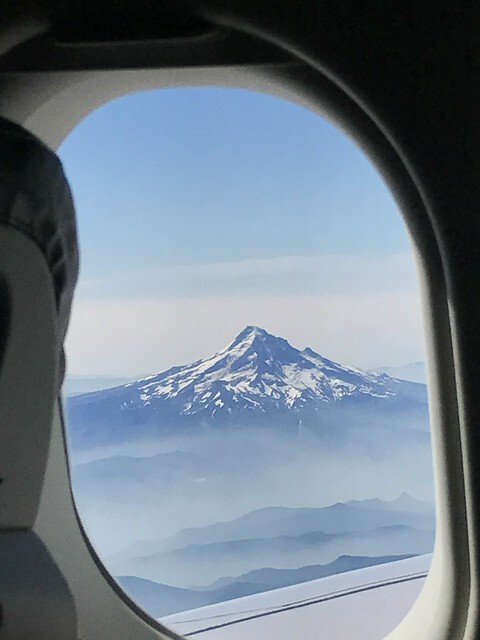 I've been to Portland a couple of times and I love it. It's a "human-scale" city, meaning (at least to me) that its buildings aren't overwhelming, it's full of trees, and it has the feeling of an older "homey" neighborhood. When I was there a few years ago, there was only one tall building, called "the Big Pink" by locals. Also the public transportation can't be beat. I love the Pearl District too, and Powell's Books! I lived in Portland from '89 to '91. It was weird back then, and I am glad to see they have been keeping it that way. The region is a model for how cities and their surrounding suburbs can work together to support public transit as well as manage growth. I can't find the video online but there's a hilarious video somewhere. 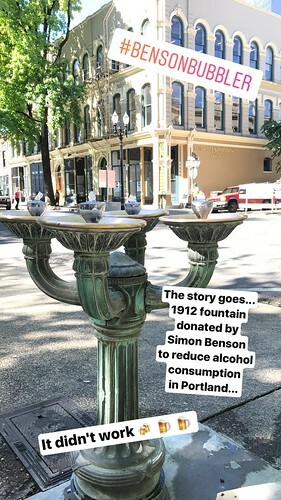 A local news station was doing a feel-good bit about the Benson Bubblers. At the very end, during the anchor's sign-off, someone walked up to the bubbler in the background, set down his bags, pulled down his pants, and climbed up and sat on the bubbler. Apparently they are used for "showering" more often than you'd expect. Who knew? !